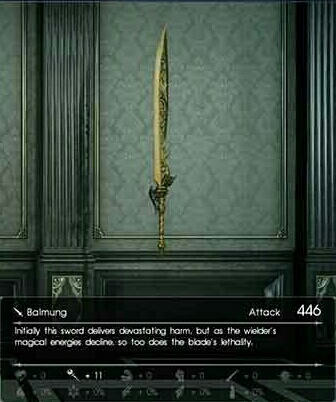 Balmung is a Weapon in Final Fantasy XV. "Initially this sword delivers devstating harm, but as the wielder's magical energies decline, so too does the blade's lethality." The special ability description here is kinda off. This weapon&apos;s damage decreases the more mp you&apos;re missing. Shortly, you highest damage with full MP.